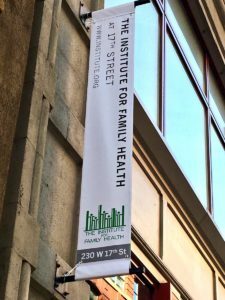 The inpatient training site for the Mount Sinai Downtown Residency Program in Urban Family Medicine is Mount Sinai Hospital, located at Madison Avenue and East 98th Street in Manhattan. Founded in 1852, The Mount Sinai Hospital is a 1,171-bed, tertiary-care teaching facility acclaimed internationally for excellence in clinical care. 1. Take 1,2,3, A,C or E to 14th Street. 2. Walk to 230 West 17th Street (between 7th & 8th Avenues).